Working as a garden designer.. Sometimes clients need a helping hand in un-muddling ideas or a steer towards what’s possible in their garden, from their starting place. I love putting on my creative hat and although often framed in the restraints of reality, it does seem to work out. That point of seeing a garden come to life is a genuine thrill for me but it isn’t magic and its creation doesn’t happen in 3 days. It takes a serious amount of time to evolve and on occasion rethinking a design or a concept completely and starting from scratch. Sometimes clients don’t want to commit to an installation straight away but prefer to have some ideas created and brought to life with sketches and some material samples. This is what I did for my lovely clients in Baldock (my now, home town). They didn’t want the full-blown scale plan and installation, they wanted ideas and so I offered them my ‘garden review service’ which felt just right for them. If and when they wanted to bring the ideas to life, that was up to them and they made it clear that they knew directly of a very good and recommended landscaper. So, with sketch pad and camera in hand, I set about photographing the garden from all angles, plotting the garden’s dimensions and aspects. I prepared a report, which detailed some ideas for hard landscaping and design ideas with feature plants, pots and planters, hanging lanterns and objet d’art. The garden was very densely overgrown with bamboo and ivy, which made the ground almost impenetrable. The back of the garden had lost its way over time and my clients felt defeated by it and frustrated. 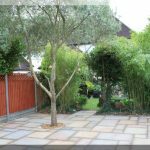 My initial idea was to have the bulk of the existing planting removed, rejuvenate the existing olive tree with a remedial prune by a professional arborist and lay sandstone paving right across the garden to make a completely new, open space. Opening up this area and giving opportunity to access the summerhouse with ease. 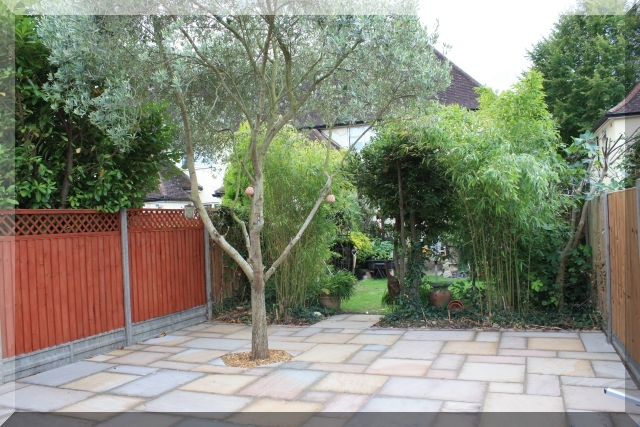 The now rejuvenated olive tree has become a stunning feature tree and can be clearly seen within the garden. The beauty of creating an open clear space is that you can play with it and embellish any way you wish and I know my clients are particularly excited about doing this. Telling me that it felt like a new room to the garden and how much they loved it. Delighted by my clients genuine happiness for their now transformed garden. Simon on Planting not just parking..